KANDAHAR, Afghan. - "A lot of advising efforts derived from having the passion to help," said Master Sgt. Janet Bretado. "I had that passion from my Family upbringing and still do to this day, as a leader you have to see past what is going on in the country and train, advise and assist those who are seeking help." Bretado, a native of Bellflower, California, is one of two female advisors from the 40th Infantry Division currently serving as part of Train, Advise and Assist Command-South. The command, which is composed of Soldiers from the 40th Inf. Div., California National Guard and 2nd Infantry Brigade Combat Team, 4th Infantry Division, is focused on training and assisting Afghan security forces and supporting counterterrorism operations. "I am part of the (Military Advisory Team) for TAAC-South," explained Bretado. "I advise the logistics section for 205th Afghan National Army Corps." As an automated logistical specialist for the past 13 years, Bretado was the perfect candidate for the team. "During my past two deployments, back in 2008 and 2010, I was the Supply Support Activity noncommissioned officer in charge," she said. "I was able to use my experience from those deployments to help my counterparts here with their Forward Support Depot, which is similar to our SSA." According to Bretado, to fully assist her counterparts she had to instruct them on the duties and responsibilities of a logistician. "It was hard for them to understand that we don't just deal with food and clothing but with every class commodity...ammo, transportation, weapons," said Bretado. "Logistics is the heart of everything; you can't help Soldiers in the fight if you don't have the correct equipment on hand." Bretado began her mentorship by incorporating systems used by the SSA into the 205th Corps FSD. "(Our counterparts) use what we call a push system," explained Bretado. "This means that the Central Supply Depot in Kabul will push items to the (205th FSD), the FSD will receive equipment and supplies that they need but most times not, which causes them to store excess lines and now they to continue ordering more supplies or equipment." The pull system, which is what Bretado integrated into the FSD, will ensure that the units receive the correct request for supplies and equipment that is needed and any excess will be sent back and be used for appropriate units. "When I first got (in country) the FSD had over 1,500 pairs of boots size five just stored because most of their Soldiers wear size seven," said Bretado. 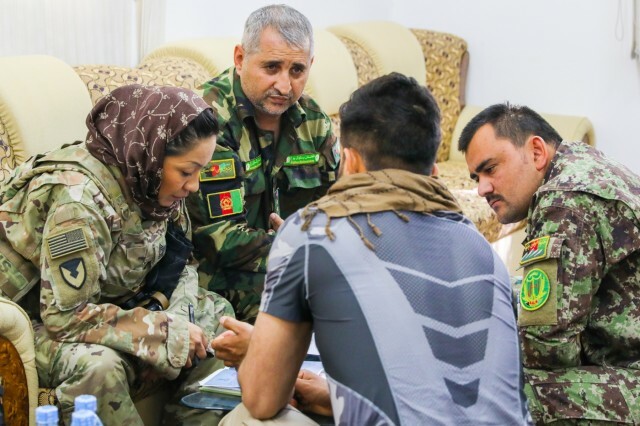 "We worked shoulder to shoulder, completed the correct paperwork and sent all the equipment back to be used for women coming into the Afghan army or police and used the pull system to get them the correct sized boots." Although the FSD is only a small portion of what Bretado is helping improve, she said her counterparts are very receptive of all her recommendations. "I won't lie, at the beginning I was terrified because of what you hear from the news about the culture and how it is being a female in the country," explained Bretado. "But from the first moment I walked in to meet (my counterparts) they have been very welcoming, they don't see me for my gender they see me as a professional Soldier trying to help." With only a few short months left for her to return to the United States and her Family, her counterparts are saddened to see her go. "She has done a great job helping us," said Sgt. Maj. Abdul Rawof Klafgani, logistics sergeant major, 205th ANA Corps. "She is a (competent) logistician and is always available when we need to reach out to her, we wish her happiness as she gets ready to go back home to her Family." 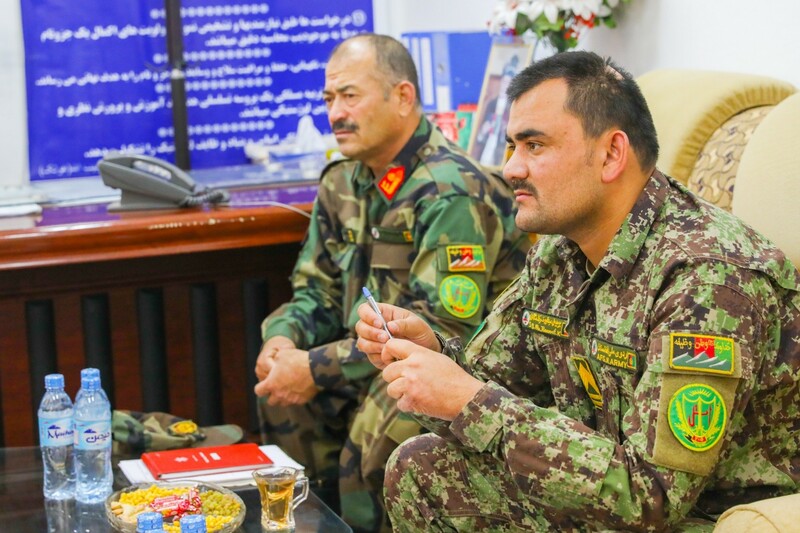 Through constant communication and a common goal to improve the Afghan army, relationships have evolved to more than just partnerships. "It has grown into a friendship sharing stories and pictures," said Bretado. "We put work aside and talk about our Families, hobbies or what is going on in our lives, it's important to know each other in order to help each other." 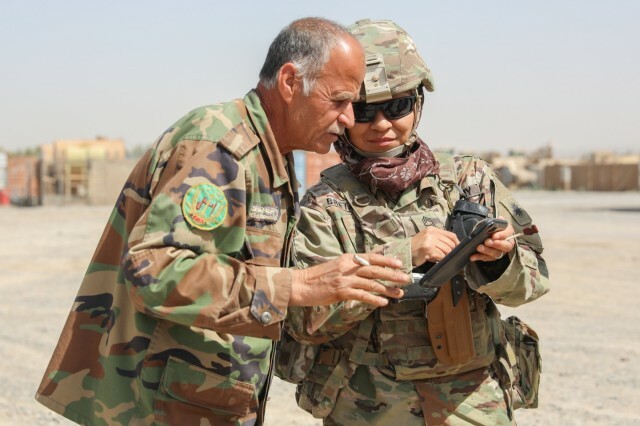 With units such as the Security Force Assistance Brigade developing, Bretado said it's important for females, especially those with experience in their military occupational specialty, to train, advise, and assist allies. "I am very happy to have gotten the opportunity to experience this," said Bretado. "It's amazing to see (our allies) grow and see that all our efforts are not being wasted. If you have the knowledge and experience to help don't let your gender stop you."